Be it to master a song, do some sound design, manipulate audio files or edit samples, the audio editor is a very precious tool in your creative arsenal. We chose nine paid audio editors from which you selected five. And here they are! 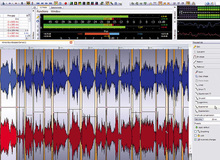 Comping is an audio editing technique that consists in putting together different takes of the same instrument in order to get the "perfect recording" without the trick being audible.